Excellent guide Tim. I also try and educate people on RSS but I find it really hard for them to get it initially. Have you got any tips that makes them relate to it better? And actually ensure they start using it? Hey sue. It certainly can be tricky. I’ve found with quite a lot of people it realistically takes a 1/2 hour one-to-one session finding relevant feeds for them and getting a personal homepage set-up before they start understanding what is going on. I’ve been trying to design a paper based exercise to explore how RSS works (sort of like an interactive group work version of the common craft videos) as I found doing a paper based exercise with tagging (using luggage labels and a selection of documents grabbed of shelves around the organisations) worked really well in getting people to grasp tagging. I’ve not however, yet, found a way of making that paper based exercise straightforward enough (perhaps RSS just is rather tricky to conceptualise unless you understand some of the technology behind it?). Hi Tim — the trouble is I help them set up their feeds and get them happening. But I am sure with most they never use it again cause they still have not got it. Well there is the paper blogging activity that Michele Martin mentions on her blog that she did at the conference. My friend Leonard Low originally talked about how you use it. So I suppose you could expand on that. Get them to add comments and then add them to a paper feed reader? 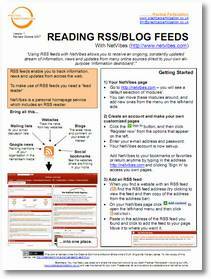 I really think we should be teaching RSS feed readers first and getting them comfortable with this first. Hi Tim–Once again, a great piece! Thank you! One thought on explaining RSS. Christine Martell and I did a paper blogging activity to demonstrate blogs. We gave people large pieces of post-it flip chart paper and had them write a post. Then we have them smaller post-its and had them visit each person’s “blog” to post their comments. At the end, we demonstrated RSS by pulling each of the flip chart pages off the wall and bringing them to one person. That seemed to help people get it.